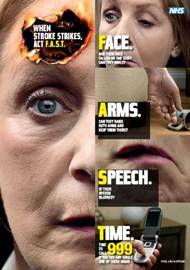 It is likely that someone suffering from stroke will have difficulty communicating. Therefore, it is important that you can recognise the symptoms, especially if you live with or care for someone who is at high risk of stroke. Facial weakness on one side. Arm weakness on one side. Slurred speech or difficulty communicating. Time is of the essence—if you spot these symptoms call 999 immediately.